Structure My Deal tools are complete — you're ready to visit Belleville Dodge Chrysler Jeep! 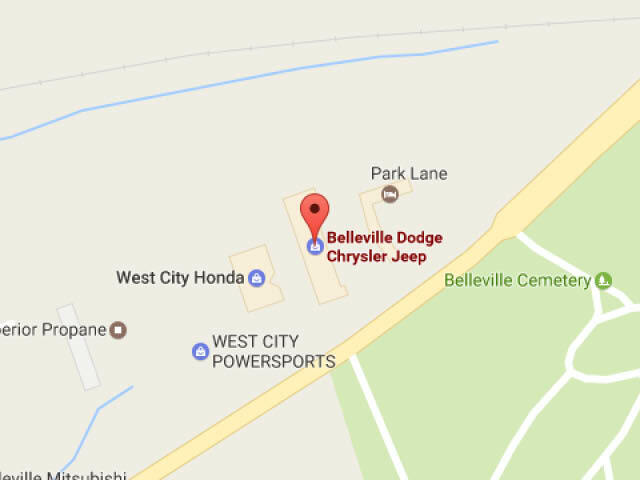 Welcome to Belleville Dodge, where you get the highest quality services carried out by friendly and knowledgeable expert staff. Getting your brake pad changed is a crucial service to ensure road safety. If you're looking for brake pad replacement in Belleville, we have the quality brake pads and skilled technicians to install them for you. We offer you original manufacturer parts to ensure the best fit and quality for your Dodge, RAM, Chrysler or Jeep vehicle. If you have a different make we have several other high-quality brake pad options to assist you. Your brake system is one of the most important components of your vehicle. If your brake pads are worn out you're not going to be able to stop as safely and effectively as you would with proper pads and rotors. It's vital to keep on top of your regular maintenance appointments and checkups to make sure that your brake pads are in suitable condition. When you change your brake pads regularly you have the opportunity to experience maximum performance and safety. That's right, we offer you the lowest price for an oil change in the city. Why go anywhere else? We have an accredited test and repair facility on site open Monday to Friday! Expect a free-vehicle inspection with every visit! If you're getting your brake pads replaced, you might also need new brakes altogether. Allow the experts at Belleville Dodge to assist you with all of your brake needs. We offer high-quality original manufacturer brakes and phenomenal quality brake pads. If you notice that your vehicle isn't stopping like it used to and you think you might need a brake pad replacement Belleville then visit us at Belleville Dodge, we are happy to serve you! When you come to Belleville Dodge for any of your auto needs you're bound to be impressed by our professional service and quality parts and vehicles. Customer service is our number one priority, and we do out part to make sure that you leave our dealership 100% satisfied. If you're looking for a brake pad replacement in Belleville, visit our dealership and experience the difference of a dealership that has your best interests as top priority always. We extend our family values outside of our households and into our business. Values such as integrity, transparency, and respect. We respect your time and your dollar, which means we are on time, and we provide quick service at a fair and affordable rate. We truly care about our customers, and it shows. Come to visit us to get a Brake Pad Replacement in Belleville and Excellent Quality Products & Skilled Technicians - The Belleville Dodge Difference; you'll want to come to our dealership for all of the services you require from here on out! Prices and Value That Can't be Beat - Discover Them Now at Belleville Dodge! At Belleville Dodge we offer frequent promotions and specials on products and services, in addition to our base affordable prices. It doesn't make sense to shop anywhere else. Don't let us convince you, though, instead we invite you to come to our dealership to see how we can offer you incredible value and quality products and services. Belleville Dodge has been a family owned business in Belleville since 1985. We've created a rewarding business based on our relationships with our customers in the Quinte region, including Belleville, Prince Edward County, and Trenton. It is our privilege to carry the newest Dodge, Chrysler, Jeep and Ram vehicles as well as one of the best selections of pre-owned vehicles in the Quinte region. President Ralph Neale has been in the automotive industry for over 30 years, and he is proud to have created and sustained a business based on honesty and integrity. Some of the ways that Belleville Dodge demonstrates this commitment to transparency and integrity are through things such as our volume pricing and no-haggle approach to pre-owned vehicles. We invite you to visit our facility and take advantage of our state-of-the-art dealership and world-class staff. Belleville Dodge is owned and operated by the Neale family. It is our goal to create a friendly and comfortable environment for you next vehicle purchase, as well as for all of your automotive service and maintenance needs. Belleville Dodge is a proud to supporter of various charities within the community such as the Heart and Stroke Foundation, the United Way, Salvation Army and the Quinte Humane Society among many others. Join our automotive family and enjoy a dealership that has your best interests at heart. "Buying my new 2017 Dodge Ram 1500"
I would recommend this dealership 10 times out of 10. The experience was relaxed and fun. These people are easy going and go out of their way to make you happy. Thanks again! Great experience with the team at Belleville dodge. 2nd purchase there! A great deal with my trade in and upgrade to my new Jeep Wrangler. Thanks to Scott, George and Janice! Awesome!!! !